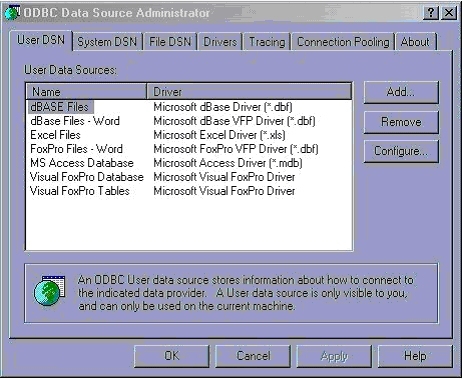 Open the ODBC Data Sources utility on your Windows system. In most versions of Windows, you'll find this option in your Control Panel. 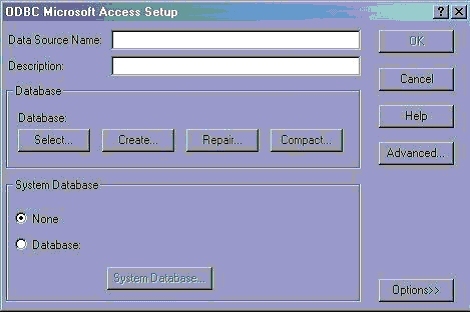 In Windows 2000, the utility will appear under Administrative Tools. Make sure that the User DSN tab is selected and click Add. The Create New Data Source dialog should pop up. On the Create New Data Source Pop-Up Double-Click (or press finish) on the MS Access Database, "Microsoft Access Driver (*.mdb)" from the list of drivers. 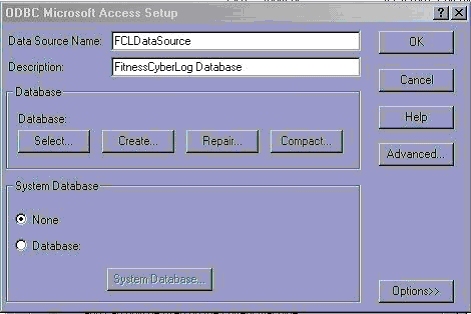 The ODBC Microsoft Access Setup dialog should pop up. Click on Select… and select your database file. 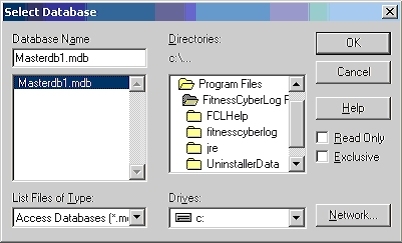 This should be under the install folder of where you installed FitnessCyberLog Personal User. Select the Masterdb1.mdb file and the press OK. This should return you to the dialog box above. Finally, click OK. This should take you back to the ODBC Data Source Administrator, which you may close by clicking OK.